To my relief both were very good. The feminine is a Diorella with tuberose. The masculine is a lovely incense composition, by Bertrand Duchaufour. ...I was dubious. Still, if Luca Turin says they are good, it is at least worth digging the samples out, no? And lo and behold, they're pretty darned good, more than good, actually, and not only in that abstract sense in which I can see why he says they're good but would rather not have to wear them, but also in the sense that hey, I'd really like a bottle of each. In particular, fans of Bertrand Duchaufour (my 2006 pick for perfumer of the year) must get their hands on Jubilation XXV. We already know that Duchaufour has a way with incense and wood (Comme des Garçons Red Series Sequoia, Incense Series Kyoto & Avignon; L'Artisan Dzongkha, Timbuktu & L'Artisan Aedes de Venustas; Eau d'Italie Paestum Rose). They aren't smell-alikes at all, but I think of Timbuktu, Dzongkha and Paestum Rose as a linked series of olfactory meditations, and Jubilation XXV joins the list as the luxury entry. It starts out bright, with citrus notes over deep incense and what smells to me like a rich fruit liqueur. As it dries down, it gets darker and woodier, but it never gets as dark or heavy as you might expect from the notes (labdanum, coriander, orange, davana, frankincense, blackberry, honey, bay, cinnamon, rose, orchid, clove, celery seeds, gaiac wood, immortelle, musk, ambergris, patchouli, opoponax, cedar, myrrh, moss and oud) — this is a full but beautifully mellow fragrance, more dusky than dark, and there is nothing even slightly churchy about it. I described Timbuktu as "dirt, soft woods, old parchment and smoky incense"; Jubilation XXV tones down the dirt a few notches (and leaves out the sweaty notes entirely), and adds something deliciously spicy and honeyed simmering in a pot two rooms over. I adore Timbuktu but wouldn't necessarily call it elegant; Jubilation XXV is Elegant with a capital E. I'd call it higher on the wearability scale than Timbuktu, and although Amouage is marketing it for men, a woman who would wear any of Duchaufour's other fragrances listed above could easily wear Jubilation XXV. Highly recommended. Amouage Jubilation XXV is an Eau de Parfum, and is available in 50 ml (€170) and 100 ml (€205). For €22, you can get a sampler of 6 of their men's fragrances (2 ml each of Jubilation XXV, Reflection, Gold, Dia, Ciel & Silver Cologne). For buying information, see the listing for Amouage under Perfume Houses, although I don't think these have made their way to the States yet. I like their bottles too, but never smelled any of their perfumes. We had some snow here al well in october but temperatures rose again. Envy you for you true winters. No Alpes somewhere in the far north of Canada that can hold the cold, so you people really get the kind of winter that we merely dream of. Gold for Men is the only one of the Amouages I've loved enough to fork over for and am so used to being nonplussed w/ scents recently that I didn't expect to fall hard for these. Certainly didn't expect to have them skyrocket to being in my top 5 scents for 2007, but they definitely are. Absolute classics. They actually smell like they're worth what they cost – and then some, given the glut of luxe scents out recently. And I dream of never seeing winter again, LOL — although I do like the first snowfall. Completely agree that they smell worth the price, or at least, like you're getting some of what you paid for in terms of raw materials. And that is rare. Very fitting scents for Amouage's 25th anniversary, and hope they'll keep on this mode — the XXV in particular smells modern yet like it could conceivably have come from the same line as Gold. I love this one. But gosh, how I love Jubilation 25. Words can't describe. that's why I've postponing the review Don't know if I could do it justice, you know? It really was a surprising coemback! Their last few launches had been underwhelming. I think your characterization of Timbuktu, Dzongkha, Paestum Rose, and this as linked meditations is spot-on; Duchaufour is one of the few perfumers working today in his own recognizable idiom, one which amazingly feels simultaneously ancient and modern. I look forward to everything he does. Basically, I'm so over JCE! It's all about the BD now. ITA! Anyone who loves classic French fruity chypres (esp the Roudnitskas and related, like Diorella, Rochas Femme, or Sophia Grojsman's Roudnitska-inspired Yvresse, or even Mitsouko) should run to try it. The structure is classic and the quality of the materials is superb. I have been wondering when something was going to come along that I really, really wanted. I'm a little short of lemmings – seriously. And thanks, because now I have something to lust after! PS That woman from Hermes has called *three times. * Can you believe? Hmmm… I like a lot of this guy's creations. I've tried the other Amouage scents: they're pleasant. Much too expensive, of course. Wonder if I can get a sample of Jubilation from somewhere. Maybe on my next trip to Harrods, in about two years' time. Oh dear, I'm not over JCE in the least. But Bertrand Duchaufour is marvelous, and entirely agree w/ simultaneously ancient & modern. Curious if you have ever tried either of his scents for Givenchy — Amarige d'Amour or Lucky Charms? Can't believe anything called Lucky Charms is any good, but who knows. LOL — that is too funny! She *really* wants to sell you a bottle, w/ the matching leather sheath no doubt. 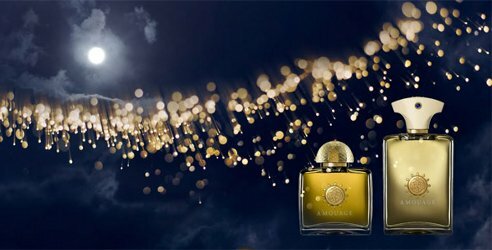 Think you will be impressed w/ both of the Amouage Jubilation thingies. It is funny how the rest of the luxury perfume market has caught up w/ Amouage….these look expensive but not out of the question for what they are. I wish I had bought Ubar when it could still be had for less than $100. You know, I think I like Gold better, but I'd be more likely to drain a bottle of Ubar — it's just easier to wear. I don't like patchouli much to begin with, so can't comment on the relative worth of the CdG vs. the Amouage, but do at least try the Jubilation scents. They're so well done. Oh lordy, when I read Luca's review and saw the incense part, the lemming started – now it's reached critical proportions. Fortunately I know of a local store that carries Amouage – must phone them up and see if they have it or will soon. $250! **faints** my credit card is weeping already. It is awfully expensive, and really, I do want both of them. Ain't gonna happen though! This was a wonderful review — if wonderfulness can be gauged by how much it makes me WANT something. It sounds like FINALLY a product might live up to it's “luxury” billing by having more going for it than just a luxury pricetag. Really, some of them just seem to be getting rather silly at this point — lucky for me since for the most part I'm not even tempted to spend that kind of money (though I guess one man's pocket change is another's mortgage payment), and most of the luxe lines tend to be overtly women's product. I have been swooning over Timbuktu lately; I really love it (and don't get a bit of the dirt or sweat that you seem to), so a similar but more elegant creation by Duchaufour sounds amazing. Where on earth did you snare a sample? I'm dying to try this and see that Perfumed Court doesn't have it yet (I was ready to order). If I get my hands on a sample and end up loving it, how about splitting a bottle? Haha! Really — I find Timbuktu so intensely earthy. I like the dirt though — it wasn't meant as a complaint. The sweat part I do find hard to take on hot days. Anyway, I think you'll find Jubilation much smoother. I got my sample from Amouage. You'd be shocked at how long I've managed to make my samples of Gold & Gold Pour Homme last — I literally wear a drop at a time. I might well do the same with these! I can see “earthy” in Timbuktu — but I get a bit of the “clean” end of the spectrum that some have described as well (the green mango note really pops for me). In any case, it's delicious and has rocketed toward the top of my faves. Perfumed Court just told me they'd be getting Jubilation XXV within a week or two, so I'm happy — I will need to make 5ml last a long, long time (and it's probably about as much of it as I can afford). 5 ml might be about my speed too! Been very good w/ perfume spending so far this year, and want to keep it that way. My willpower only came to me (of course!) after my collection was so ridiculously large that even an idiot (e.g., me) could see I had more than I could ever use. Oh dear. This is one of the best things I've sniffed in a long time. Robin, you are far from being the only one who misses Amouage Ubar – I have a only few precious drops left and I can't imagine life without it! I am sure the Jubilation XXV is fabulous, but Ubar is my favorite Amouage, even more than Gold, and that's saying a lot. If they ever bring it back I am SO there! I thought it was a bad match w/ its name and bottle — they ought to bring it back w/ new packaging.